If you're interested in a teaching career, earning an associate degree in education online is a great way to get started. An aging U.S. population continues to impact many industries, and education is no exception. As the number of U.S. retirees continues to increase, so does the demand for new teachers to replace them. According to the U.S. Bureau of Labor Statistics, demand for pre–K through grade 12 teachers is projected to grow by 7–10% over the next 10 years. The profession is also known for offering steady employment. The National Center for Education Statistics reports that 80% of public school teachers with 1–3 years of experience remained employed at the same school. While faculty staffing at public schools often depends on state and local government budgets, the BLS projects that enrollment at elementary, middle, and secondary will increase in the coming decade. According to the BLS, private schools and charter schools will also drive job creation and overall growth. Where can an Online Associate Degree in Education Take Me? We selected the degree programs based on the quality of program and range of courses provided, as well as school awards, rankings, and reputation. Southwestern Assemblies of God University ranks #1 on The 14 Best Online Associate in Education Programs! Founded in 1943, SAGU is based on a 70-acre campus in Waxahachie, Texas. The university offers a fully online associate degree in education that emphasizes instructional technology and the foundations of education through coursework in psychology and child development. The program requires 60 hours, including 14 general education hours, 12 hours in the behavioral sciences, and seven hours in the natural sciences and mathematics. SAGU is a Christian university and requires 12 hours of Bible coursework. Applicants hold a high school diploma with a minimum 2.0 GPA and must submit ACT or SAT scores. SAGU requires students to provide a Christian character reference and evidence of a spiritual experience. Transfer applicants do not need to submit ACT or SAT scores. Students have access to job training at the career center and online counseling services. Employed teachers may be eligible for a teacher enhancement grant. Southwestern Assemblies of God University is regionally accredited by the Southern Association of Colleges and Schools Commission on Colleges (SACS). Liberty University ranks #2 on The 14 Best Online Associate in Education Programs! Located in Lynchburg, Virginia, Liberty offers an associate of arts in education in an asynchronous format. The online associate degree in education provides foundational knowledge in behavior and development, and the curriculum covers a variety of academic theories and teaching methodologies. Learners study lesson plans and current trends in public and private childcare facilities. Required courses include communication, technology, Christian life, and information literacy. Students complete at least 21 hours in general education and educational theories courses. The 60-hour program requires no practicum, and transfer students may apply up to 45 hours toward the degree. The program follows eight-week terms, and students access online courses through Blackboard. Liberty offers financial benefits -- including reduced tuition rates, application fee waivers, and textbook stipends -- for service members and their spouses, DOD employees, and emergency response workers. Liberty awards credit for military training. Applicants must submit previous transcripts. Liberty University is regionally accredited by the Southern Association of Colleges and Schools Commission on Colleges (SACS). Granite State College ranks #3 on The 14 Best Online Associate in Education Programs! Located in Concord, New Hampshire, GSC offers inclusive admission requirements and a rolling admission process that is ideal for transfer students. GSC's online associate of arts in general studies with an education concentration provides a pathway to a paraeducator certification. The 60-credit curriculum includes general education requirements such as writing, math, and social psychology coursework. Students earning the associate degree in education gain knowledge in child development and educational theories. Transfer students can apply up to 44 previous credits toward the degree. Students have access to career counseling, digital libraries, and research assistance. GSC also offers disability services and an alumni association. GSC admits any applicant with a high school diploma or its equivalent and offers prior learning credit for life experience, military training, and work experience. GSC offers discounted tuition rates for veterans and military members. Granite State College is regionally accredited by the New England Association of Schools and Colleges, Commission on Institutions of Higher Education (NEASC-CIHE). State Fair Community College ranks #4 on The 14 Best Online Associate in Education Programs! Based in Sedalia, Missouri, SFCC enrolls more than 2,000 online students. The college offers an associate of arts in teaching that requires 66.5 credits. The program is available fully online, with the exception of a 30-hour classroom practicum and optional in-person meetings with instructors. The associate degree in education requires general education coursework and major classes in areas such as technology for teachers. Service members and their dependents qualify for in-district tuition rates. SFCC accommodates disabilities by providing extended test times, alternate testing environments, and Braille texts. Missouri residents older than 65 can enroll free of charge in courses that did not reach maximum capacity. The college accepts transfer credit, but students must earn at least 15 credits through SFCC. Applicants must hold a high school diploma or its equivalent and must submit ACT scores. Applicants must submit to a background check. SFCC accepts applications through the first week of each semester. State Fair Community College is regionally accredited by the Higher Learning Commission (HLC). Hagerstown Community College ranks #5 on The 14 Best Online Associate in Education Programs! Located on 319 acres in Maryland, HCC offers an associate of science in education designed for students planning to transfer to a four-year institution or pursue elementary teaching certification. Students earning the associate degree in education online typically graduate in two years. HCC students take English and mathematics courses during their first semester. The curriculum also includes coursework in special education, race and ethnic relations in the U.S., educational psychology, and early childhood education. HCC delivers online coursework through Moodle. Online students receive help securing internships, and student advisors assist with course selection and career planning. HCC awards credit for prior learning, such as industry certifications and advanced placement exams. Online students have access to research services and multimedia resources. HCC students must maintain at least a 2.0 GPA. HCC accepts transfer credits from regionally accredited institutions. Hagerstown Community College is regionally accredited by the Middle States Commission of Higher Education (MSCHE). Lone Star College System ranks #6 on The 14 Best Online Associate in Education Programs! Based in The Woodlands, Texas, LSC offers an affordable, 60-credit associate of arts in teaching degree. The two-year program requires one summer semester and fulfills the core requirements of most bachelor's in teaching programs. LSC maintains articulation agreements with four-year universities, which include easy transfer processes, tuition discounts, and waived application fees for its graduates. LSC's associate degree in education requires some field-based courses in elementary classrooms. Along with observation and student-teaching requirements, the associate degree includes coursework in special populations and world regional geography. Students can fulfill the English requirement through a course in children's literature. Per state guidelines, the program requires coursework in Texas government. LSC provides online services including access to an academic advisor, a student success center, counseling, career services, libraries, and research assistance. Disability services include ASL interpreting and online captioning for lectures. Lone Star College is regionally accredited by the Southern Association of Colleges and Schools Commission on Colleges (SACS). Tyler Junior College ranks #7 on The 14 Best Online Associate in Education Programs! TJC is one of the largest two-year colleges in Texas. The college offers an associate of arts in teaching that fulfils the first two years of requirements for a bachelor's degree in teaching elementary school, middle school, or special education. The primarily online associate degree in education requires 60 credits, including 44 core credits and 16 major credits. Students take courses in art appreciation, Texas history, and public speaking. The program does require in-person classroom experience. New students complete an orientation exploring student services, tutoring access, and the Canvas learning management system. TJC offers career guidance, and the college's alumni association publishes magazines and alumni newsletters. TJC provides 150 hours of free tuition for Texas veterans and their dependents. Applicants must submit to a background check. TJC does not require an application fee. Applicants must submit transcripts, proof of a meningitis vaccine, and Texas Success Initiative Assessment scores. Tyler Junior College is regionally accredited by the Southern Association of Colleges and Schools Commission on Colleges (SACS). Lehigh Carbon Community College ranks #8 on The 14 Best Online Associate in Education Programs! Founded in 1966 in Schnecksville, Pennsylvania, LCCC offers two-year degrees, workforce training, and specialized diploma programs. LCCC enrolls more than six thousand students, including more than a thousand dual enrolled high school students. Students in LCCC's online associate of arts in education earn credits that transfer easily to four-year teaching programs. The curriculum includes coursework in educational theory and incorporates more than 60 hours of classroom observation time. Students also complete coursework in mathematics and literature. LCCC's accessible admission process does not require standardized test scores. Applicants to the online associate degree in education program must have a high school diploma or its equivalent. LCCC accepts applications on a rolling basis. The college awards credit for military and life experience. LCCC matches transfer students to advisors with expertise in the student's field. Online students have access to services including tutoring and digital libraries. Students receive excess financial aid in the form of bookstore vouchers. Lehigh Carbon Community College is regionally accredited by the Middle States Commission of Higher Education (MSCHE). Laramie County Community College ranks #9 on The 14 Best Online Associate in Education Programs! Located in Cheyenne, Wyoming, LCCC offers 76 associate degree programs, including an associate of arts in education that includes asynchronous online instruction and classroom observation experience. The 61-credit online associate degree in education offers concentrations in early childhood education, elementary education, and grades 7–12. The program trains future educators to recognize diverse learning styles and utilize age-appropriate teaching strategies. The curriculum requires courses in human lifespan development, educational psychology, and world geography. Students learn practical teaching techniques during a public school practicum. Prerequisites include courses in English, reading, and writing. LCCC provides online student services including academic advising, disability accommodations, IT support, and counseling. The college accepts transfer credit from regionally accredited institutions. Applications are due at least two weeks before the start of the semester. The college bases math, reading, and writing placement on the applicant's ACT scores, cumulative GPA, or placement exam. Applicants must submit to a background check. Laramie County Community College is regionally accredited by the Higher Learning Commission (HLC). Southern Arkansas University Tech ranks #10 on The 14 Best Online Associate in Education Programs! SAU Tech, a public community college founded in 1967, offers an associate of science in teacher education. The 61-credit teacher education program helps students develop their own educational philosophy and provides practical tools for future public school educators. The asynchronous, fully online curriculum includes coursework in American government, state history, and art appreciation. Major courses include educational technology, math for teachers, and Praxis preparation. The associate degree in education also requires courses in college algebra, writing, and child growth and development. SAU Tech delivers online courses through BrightSpace. SAU Tech's low student-to-teacher ratio allows instructors to provide students with individualized attention. Online students have access to free tutoring, counseling, mentoring programs, and research assistance. The student success center provides career assessment testing and job placement services. Applicants must provide proof of MMR vaccinations. Southern Arkansas University Tech is regionally accredited by the Higher Learning Commission (HLC). Navarro College ranks among The 14 Best Online Associate in Education Programs! Based in Corsicana, Texas, Navarro is a community college emphasizing self-paced and individualized instruction. The college's first students consisted mainly of World War II veterans. Navarro offers an affordable online associate of arts in teaching that requires 60 credits. The program is only available to Texas residents and prepares students to pursue a four-year teaching degree and teaching certification. Major courses include mathematics for teachers and introduction to teaching, which involves at least 16 hours of observation in public school classrooms. Students also complete an introduction to special populations course, which provides an overview of education from the perspectives of language, ethnicity, and socioeconomic diversity. The online associate degree in education requires coursework in Texas state history, Texas government, and behavioral science. Students can earn up to 30 credit hours from prior learning experiences, including military and industry training. Navarro awards more than 50 merit scholarships. Distance learners have access to online library resources, including ebooks and audiobooks. The career center provides textbook loans, online tutoring, and an online job board. Navarro College is regionally accredited by the Southern Association of Colleges and Schools Commission on Colleges (SACS). 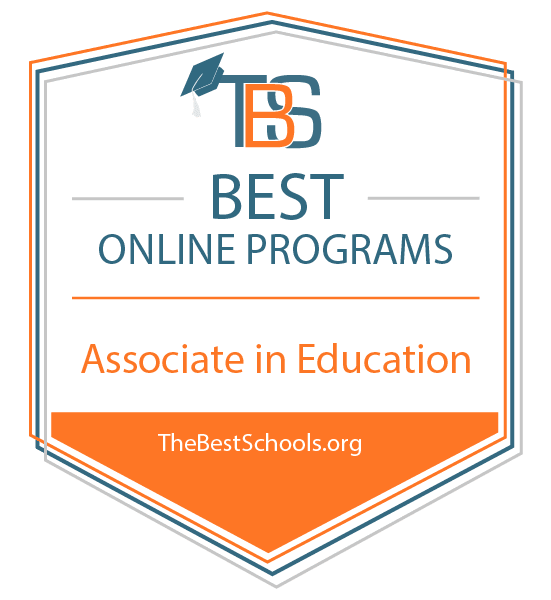 Panola College ranks among The 14 Best Online Associate in Education Programs! Founded in 1947 in Carthage, Texas, Panola offers an online associate of arts in teaching that qualifies graduates to work as paraprofessional educators in Texas and fulfills the first two years of a bachelor's degree in teaching. Teaching students choose from two concentrations; the first prepares learners to teach general subjects and special education in grades K–8, and the second trains learners to teach specific subjects in grades 6–12 and all levels of special education. Students pursuing the first concentration take courses in stars and galaxies, general biology, and physical geography. Students in the second concentration complete a general core curriculum and focus on the subject they plan to teach. Core courses include U.S. history and the federal government, along with electives in arts and behavioral sciences. Students access all course materials online through Canvas. Panola provides financial aid, individual tutoring, and research assistance. Students can earn credit through examinations and ACT scores. Applicants must submit TSI scores, high school transcripts, and proof of a meningitis vaccination. Panola College is regionally accredited by the Southern Association of Colleges and Schools Commission on Colleges (SACS). Arkansas Northeastern College ranks among The 14 Best Online Associate in Education Programs! Based in Blytheville, ANC has five campuses throughout Arkansas and boasts small class sizes and affordable tuition rates. The college offers a 65-credit associate of science in education that prepares students to pursue bachelor's degrees in teaching. The program includes courses such as math for teachers and a survey of the exceptional child. Students complete general education courses necessary to transfer to a four-year institution. Students may test out of core curriculum requirements through ACT, SAT, COMPASS, or Accuplacer scores. ANC offers low-cost or free childcare, and the advising center provides academic and career counseling. A student-led organization provides peer mentoring, and veteran affairs representatives help military students apply for financial benefits. ANC offers community education through noncredit courses for adults and children. Applicants must attain passing scores on the Praxis reading, math, and writing tests and must have at least a 2.7 GPA. Arkansas Northeastern College is regionally accredited by the Higher Learning Commission (HLC). Arizona Western College ranks among The 14 Best Online Associate in Education Programs! Based in Yuma, AWC enrolls more than 12,000 students annually. Established in 1960, the college offers associate of arts degrees in elementary and secondary education. Both programs require 64 credits and include a classroom practicum. Students in the elementary education program take courses including math for elementary school teachers, cultural diversity in education, and children's literature. The curriculum also includes courses in lesson planning and classroom management. Students pursuing the secondary education degree take courses in special education and child growth and development. Because secondary educators typically teach a specific subject, the secondary education program allows greater customization through electives such as public speaking, substitute teaching, and biology. AWC offers the online associate degree in education programs primarily asynchronously. AWC accepts transfer credits from regionally accredited schools. High school students pay discounted tuition rates. AWC offers tuition assistance for active service members. Along with Arizona residents, California residents pay in-state tuition rates. Online students have access to resources including career services and a health and wellness center. AWC admits all applicants who are older than 18 and hold a high school diploma or its equivalent. Arizona Western College is regionally accredited by the Higher Learning Commission (HLC). An online associate degree in education can help kickstart your teaching career, but schools at the elementary level and beyond require require at least a bachelor's degree to teach students. Additionally, public school teachers must be state certified, which usually requires an undergraduate degree. While certification isn't required to teach in private schools, most prefer candidates with a four-year degree in education or a specific subject, such as math, science, or English. Bachelor of Education: A general bachelor's in education prepares graduates for a career in teaching, covering basic concepts such as lesson planning and curriculum development. Those who wish to teach a specific subject, such as math or history, must seek an additional degree in that discipline. Bachelor of Arts in English: This degree is designed for those who wish to teach English at the middle or secondary level. Core courses address common instructional methods, with a focus on teaching students from diverse cultural backgrounds and in different educational settings. Bachelor of Science in Early Childhood: Sought by prospective pre-K and elementary teachers, this degree focuses on early academic, social, and cognitive development. Its curriculum centers upon theories and methods used to instruct, encourage, and inspire young children while building fundamental skills.